Harry Macklowe’s 200 East 59th Street is both a development unto itself and the culmination of a his career’s work. 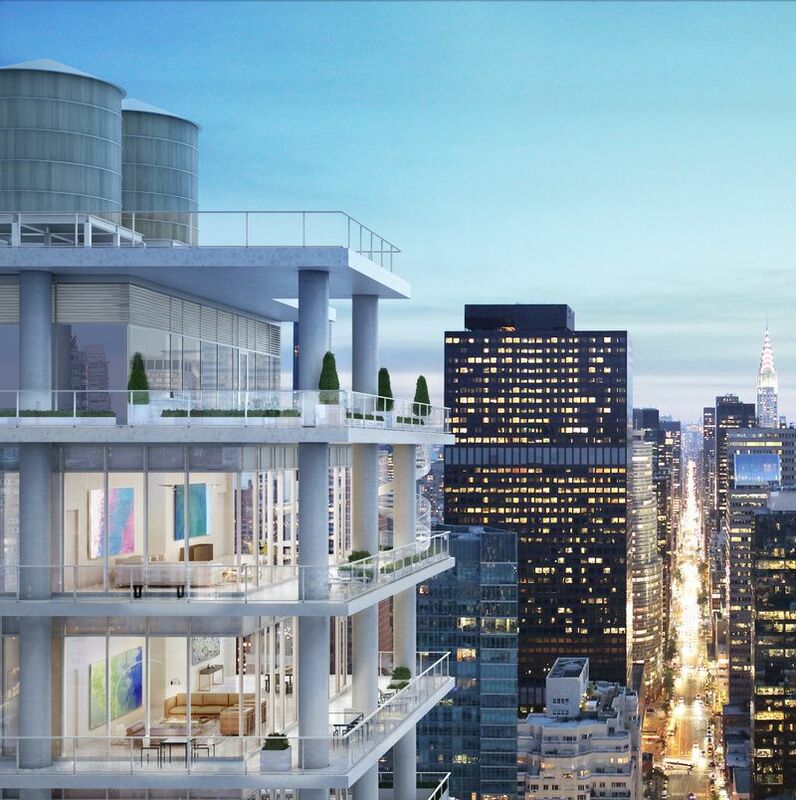 Standing 35 stories above Third Avenue, the luxury condo project has been referred to as the 81-year-old visionary’s “Florida building” because each of the 67 units has its own wrap around deck, a common feature in Palm Beach and Miami but heretofore unheard of in Midtown Manhattan. From the street level, the white tower has a skeletal appearance. Horizontal bones and vertical vertebrae are visibly interwoven while the glass curtain wall is recessed from the balcony edge. If it seems like the building has been turned inside out, it’s because it has. The cylindrical white columns lining the façades aren’t an aesthetic touch, they are the building’s super structure pulled out to maximize interior square footage. While most developers would be happy to play the big picture role, crunch the numbers and bring in the experts to handle the rest, Macklowe has taken an acutely hands-on approach with 200 East 59th, walking the property regularly to make sure his vision is being executed as he intended, right down to the staging of individual model units. He hasn’t been afraid to make wholesale changes during the construction process, even going so far as to have whole walls of marble swapped out because the veins were too pronounced. When first asked about his latest skyscraper, Macklowe demurred. It was a team effort, he said, the collective output of Macklowe Properties and architects CetraRuddy. But the commercial-broker-turned-megadeveloper has left his fingerprints all over 200 East 59th, as he has many buildings before. A walk through the nearly-completed residential tower reveals a trail of breadcrumbs retracing some of his greatest achievements. The kitchens, for example, bear a strong resemblance to 432 Park — the second-tallest building in the city after One World Trade Center — with white cabinetry, marble counters and Miele appliances. Other references are less subtle, such as the glass cube through which residents enter on 59th Street, harkening to the famed installation at Apple’s flagship store on Fifth Avenue, a feature that Macklowe came up with in collaboration with Apple co-founder Steve Jobs. The blisteringly white marble and vertical wall fins running up to the lobby’s double-height ceiling, also pay homage to the GM Building, which Macklowe bought in 2003 before a credit crisis forced its sale in 2008. “Each building is a crucible and the experiences of building buildings of the past are always incorporated into the next building you’re building,” he said. “It’s fun too, in your designs, to learn from what it is you’ve done and it’s always fun to look back at all the design triumphs and mistakes that you’ve made and cull these thoughts and ideas and put the best of what you’ve learned or have now innovated and thought about into that process. Macklowe’s accrued knowledge and attention to detail are indeed on display inside the units. From sound-deadening walls and doors that insulate master bedrooms to automated blinds that stow away into the ceilings above each window, the developer has gone to great lengths to curate spaces to address resident needs. With 12 ft. slab-to-slab floors, McGraw Hudson Construction Corp., Macklowe’s in-house project management team, was able to stash all the necessary mechanicals above the ceiling without diminishing the 10 ft. clearance. Additionally, instead of cramming an HVAC control panel into each unit, the developer has placed them on separate terraces near the elevator banks to save space. Also, along with making the units appear larger, the wrap around terraces add between 100 and 200 s/f of additional living space to each unit while the external support beams also save interior floor space. Prices range from a shade under $2 million for single-bedroom units to more than $15 million for the dual-floor penthouse, which features a spiral staircase on its extra-wide balcony. Model units opened last month and so far the property has drawn interest from an eclectic mix of potential buyers, many of them executives from other states or countries looking for a pied-à-terre for Manhattan business trips. Sales representatives expect the building to draw local interest as well. Surrounded by medium-rise buildings, 200 East 59th Street offers extensive views down Third Avenue, over the Queensboro Bridge and across Central Park. The penthouse vista encompasses nearly the entire park and stretches out to the New Jersey Palisades. Macklowe said he was first drawn to the property because of prominence it offered at a nexus point of the East Side, where the commercial business district in Midtown meets Uptown residential. The idea for the building itself came to him on a flight five or six years ago. He sketched it out on that day’s issue of the Wall Street Journal and now that drawing is nearly a reality, with the finishing touches expected to wrap up in early 2019.